Happy Friday everyone! 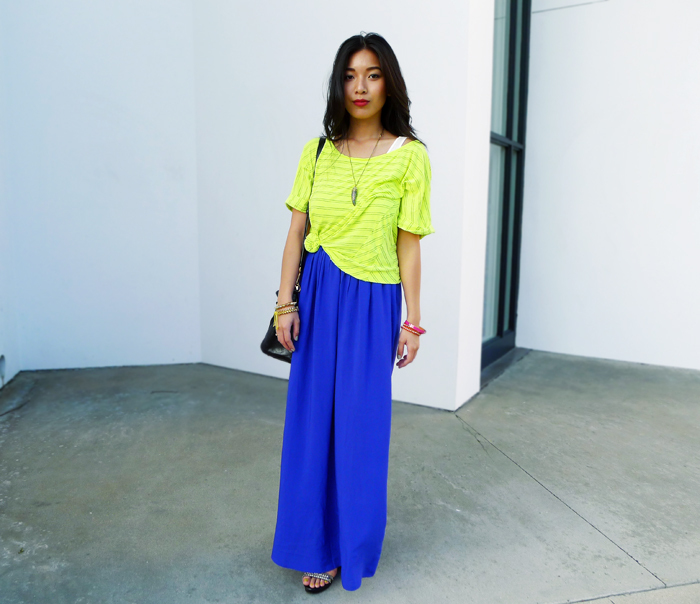 I've brought back my blue Forever 21 maxi dress and this time styled it with a highlighter Michael Stars top. I love the electrifying color combination; totally on track on my color shift through the season from pastel to neon and brights. The trick to fixing any big or wide t-shirt is tying it into a cute side knot. Pick a side and hold out the corner; twist it into a rope, then tie through a loop once. Instant chic. With such a bright outfit, I go with a subtle statement necklace, like this tribal horn necklace from Number A. Easily pulls together any outfit, whether it's a summer day romper or a denim bustier dress for nighttime mingles. I'm starting a series of giveaways to show some love back to you amazing readers. To start, my friends from Number A and I teamed up to give away this super rad necklace to one lucky reader and to offer all my lovely readers a 10% discount on purchases at their store using the code: HONEYNSILK. You definitely want to check their selection out, you're guaranteed to find something you love. 3) Leave your name and e-mail address in the comments! That's it! A winner will be randomly selected and announced on May 12th. Good luck! I absolutely love your outfit, especially that neon top! All very stylish ..love this look! So bright and vibrant, these are beautiful colors on you! Love love the long skirt! That color combination is great! 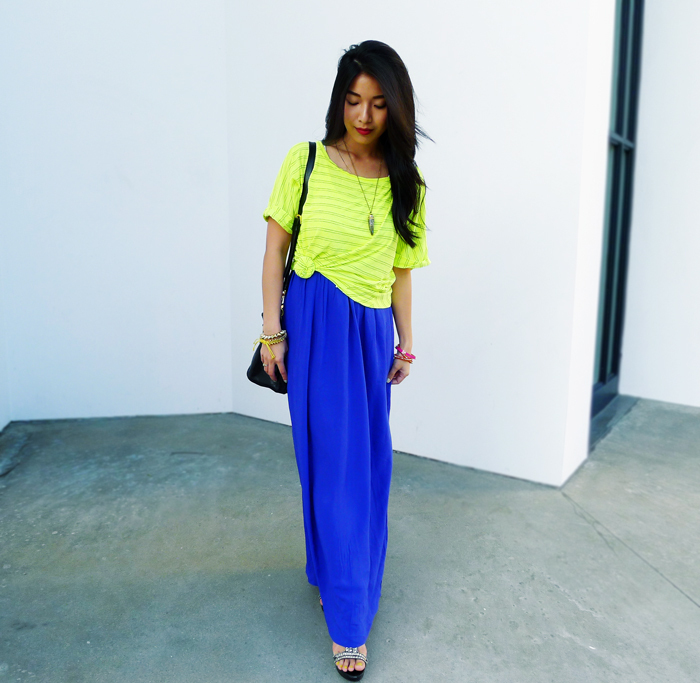 I love the neon - I wore a skirt that exact color the other day too. It's such a bold and playful color. Great giveaway. :) I already follow you on Twitter and GF. I now like both pages on FB. That's a beautiful colour combo! adore this blue and yellow combo! a-ma-zing outfit! love the color combination! love this combination of colors!!! very cool outfit, I love the fact that both top and bottom are strong colours and still looking great. I liked all the pages and followed you on twitter. Also wanted to follow via GFC but the Follow button doesn't appear on the top of the page. Do you know how I can follow you? Great outfit! I love the rich, bright color combo. What a wonderful blog and super cute outfit! You have a new follower my dear! Great giveaway! I am a follower on gfc and bloglovin. "liked" Number A as well as honey & silk on facebook! darn i don't use facebook but love your giveaway. your blog is inspiring. Your outfits are fun. You are also very pretty. I'm your newest follower! I hope you'll follow me back and we can keep in touch. Really love the color of your skirt & top! Cool skirt! Love this outfit <3 ! 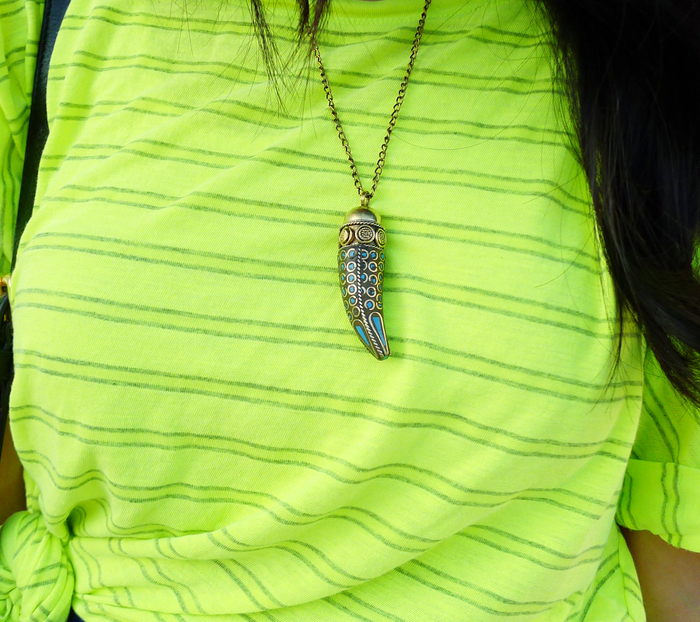 Folowed on GFC and Twitter (@corrina_grace) as well :) Love this necklace for the tribal trend! i like Number A and honey & silk on Facebook! I followed both on facebook (Shelby Bilbruck), Thanks for introducing me to Number A, I LOVE their stuff! I like Number A on Facebook and honey & silk on Facebook! I follow honey n silk on gfc! I also followed on twitter as @Azurielm. I like both pages on facebook-tracey byram. Loving the neon and blue together. Such deep blue color looks amazing! Truly lovely outfit! Now I may try to piece together something neon ;D I liked both pages on facebook. I'm also following you on twitter @Kantaroukun! Thanks for the fabulous giveaway! And I follow you on Twitter as @babybraddy!